Technically, the replacement wallpaper image could be lighter, but you’ll find notifications are very hard to read. It also doesn’t need to be a repeating pattern, though it will look much better if a tiling image is used because it becomes repeated if the screen size is larger than the pattern. This returns the original linen image to the background of Notifications, slide it open to confirm everything is back to normal. This is aimed more at advanced users who are comfortable with the Terminal. Even if you’re a command line fanatic it’s still easier to use the MountainTweaks automated approach outlined above. Nonetheless, many of us just like to know how things work and where stuff is located, so here’s how to manually change the Notifications wallpaper. Find a suitable pattern replacement, open it in Preview app, and save it as a TIFF image named “linen.tiff” to the desktop – this is important because the replaced file must be converted to a tiff file with the same file name in order to work properly. Because this uses sudo you’ll likely need to enter the admin password. Slide open the Notifications Center to see your new pattern. 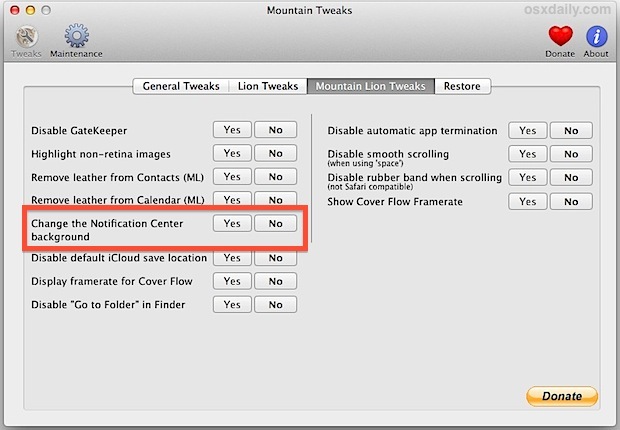 If you want to revert the change manually, just swap out the replaced linen.tiff file with the backed up linen.tiff, then kill NotificationCenter again. 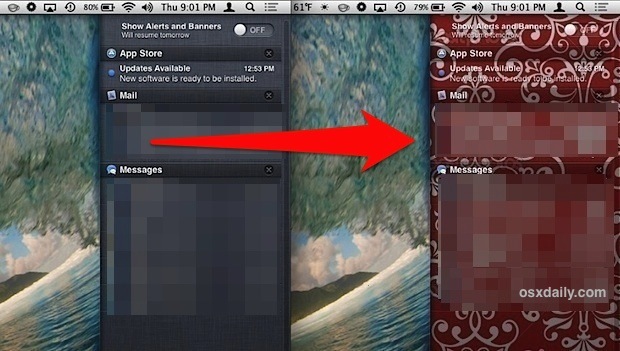 Want to customize the Notification Center a bit more? You can also change its alert sound to something else. How can this be done on Mavericks?